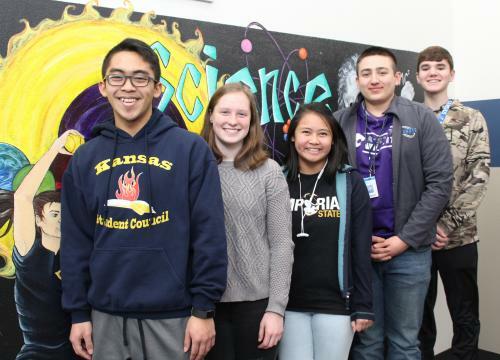 Chanute High School’s Scholars Bowl team faces some new competition when it heads to regionals. With the reorganization of Regionals this year the CHS team will face teams they’ve never played before, said Coach Joe Holman. The 4A State Regional tournament on the east side of the state is at Fort Scott, where CHS will compete in the same Pool as teams from Atchison, Garnett, Kansas City-Piper, Louisburg, Ottawa, Tonganoxie and Wamego. Their record has to be good enough to advance to a final between the two Pools to have a chance at going to state. The team of four seniors and two juniors is optimistic. “We got this,” one said. “We’re the bomb,” said another. Actually, they’re excited to be “back together” for regionals. With team members involved in multiple activities, the upper classmen can’t attend every tournament. “We haven’t all been to a tournament in a while,” Jay Brown said for the group, which besides himself includes Angelo Andoyo, Mikayla Kwek, Isaac Lewis, Darbee Chard and John Stanley. It’s the variety of skills and knowledge among team members that makes them competitive. “Most of us have favorite subjects at school,” Kwek said, and bring different talents to the team. “We’re all just curious about learning stuff so we pick up certain facts,” Andoyo added. “Angelo is really good at human anatomy and he’s very, very good at spelling,” Chard offered. “Mikayla knows what’s up with literary works. She knows things about books, the main character, the author, and parts of speech and what kind of verb it is,” Stanley said. “Darbee is kind of our pop culture kind of person. She’s good with movie and musical history or if it’s a band or song,” Brown said. “John Stanley brings all the random information and he knows a lot, a lot, a lot about science,” Kwek volunteered. “What are the two moons of Mars?” Brown throws out. Phobos and Deimos, the mythological sons of Ares, Stanley provides. “One of our weakest areas is sports and Jay (Brown) is usually the one who picks that up,” Andoyo said. Isaac Lewis, he’s the fine arts, the team agreed. In the midst of a round, it is usually during the math and science questions that CHS can make a comeback. They rely on Stanley and Brown to solve the math equations, so the two sit next to each other. Depending on their score or the other team’s skill and quickness, they may solve the problem independently or consult one another. No matter what happens, with four seniors graduating the Scholar’s Bowl team will be looking for some new members next year. It’s cool traveling around, meeting kids from other schools,” Andoyo said. “If you lose, they feed you, so why not join?” Kwek added. “If you’ve spent the first 15 years of your life soaking up useless information, come out,” Stanley added.